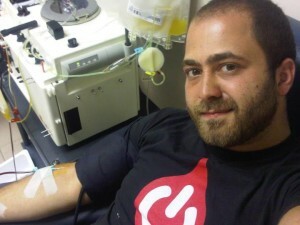 BEIRUT: When was the last time you donated blood? That question creeps guiltily into one’s head when talking to 23-year old student Yorgui Teyrouz. Teyrouz is what one might call resourceful. Through his lowly mobile phone, he has built up a successful blood bank database that matches volunteer donors to those in need of a transfusion. An undergraduate student at the Lebanese American University, Teyrouz first thought of the idea as a scout leader, when he suggested creating a blood database among members. As a volunteer at the Lebanese Red Cross, he became aware of how scarce blood donors were. But it was only after the grandfather of a friend failed to find donors for a blood transfusion of the very rare blood type AB – that Teyrouz decided to launch a fully-fledged mobile phone database. In 2007, he founded Donner Sang Compter to coordinate the growing number of willing donors with needy patients. In French, the name means “to give without expecting anything in return,” but is also a play on the word sang, which means blood. Today more than 1,000 patients have benefitted from blood, platelets and plasma donated by the database’s 5,000 registered donors, and the number of people who call in search of blood is growing steadily every month. In June alone, Donner Sang Compter answered 112 separate blood demands, filling an important gap in the medical sector. While many people hear of the service through word of mouth, Teyrouz and his team of volunteers also give talks at schools, clubs and universities, and set up awareness stands to recruit new donors. There is also a Donner Sang Compter group on Facebook with more than 6,200 members. Teyrouz’s answer to donor scarcity was recently awarded a $50,000 prize in the King Abdullah II Awards for Youth Innovation and Achievement. The Jordanian award, which was this year presented at the World Economic Forum in May, recognizes youth-driven community projects in the Arab world. Teyrouz will use the money to build a sustainable blood bank database and employ full-time staff members. Karma aside, donating is also good for you, as Teyrouz points out. Teyrouz receives an average of 10 phone calls every day from people desperately seeking blood donors. During the interview, he takes a call from somebody who needs A + blood. Opening up his database, Teyrouz flicks quickly through his Excel sheets to find a match.